There are certain unique foods produced in France which I love. One of these is the green lentil from Puy. These are my favourite lentils because they have a lovely peppery flavour, they don’t go mushy when cooked and they make me feel healthy because they are rich in protein. Their uniqueness comes from the valley where they have been grown since pre-Roman times, Le-Puy-en-Velay in the Haute Loire, which has a micro climate with low humidity due to the surrounding old volcanoes. They are naturally cultivated without extra watering or fertilisers. Unlike other lentils their skin is very thin due to the lack of humidity so they do not need to be soaked beforehand. Smaller than most lentils, their colour is a dark green to steel blue due to anthocyanin, a pigment, which is also present in blueberries and red grapes. Because their uniqueness is due to their origin they are certified both AOC and AOP. 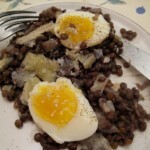 There are lots of recipes for Puy Lentils, both hot and cold, this week I decided to do a really simple country dish with fresh herbs and topped it with grated 24months matured Parmigiano Reggiano and medium soft eggs (mollet). Peel and chop the onions and garlic cloves coarsely. Wash the Puy green lentils and fresh herbs in water and drain. Pour about 800mls of cold water into a large, heavy based saucepan add the lentils, onions, garlic, herbs, thyme, bay leaves and bring to the boil. Add the stock cube/ stock powder and knob of butter, stir in, cover and reduce heat to simmer gently. Cook for about 25minutes. Grate the cheese in thin slices. Remove the saucepan lid when lentils are cooked, if there is still a lot of liquid raise the temperature a bit and stir while liquid eveporates. There should be a little moisture left. Put the lentils in a serving dish, drizzle over them 1 tablespoonful of olive oil and 1 of vineger, keep warm. 10 minutes before serving, put the eggs in a saucepan of cold water and bring to boil for 6 minutes exactly. Remove eggs from water and remove shells, holding the egg with a cloth as they are hot. Put the grated parmesan over the warm lentils. 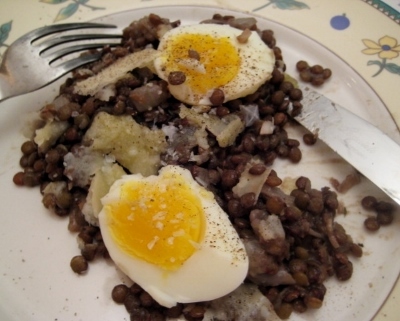 Place the eggs over the parmesan and slice them in half so that the egg yolk can run (in theory) over the lentils. Sprinkle with some Fleur du sel de Guerande and a couple of twists of ground black pepper and serve immediately. I recommend serving this tasty dish with a light red wine such as a young, non-wooded cabernet sauvignon.